Dawn Moor hasn't added any friends yet. The well-cropped purple-haired male who stood in the place of Dawn seemed studious and aloof.An intense shrewdness froze to his expressionless face as plain and effortlessly as if it had been painted on.He listened, but he made no particular note of a desire to participate right away.A lot of questions were on his mind.A lot of variables to calculate.Many mentioned by some of the others. Are the NPCs on this planet loyal to the General? What sort of weather can they expect? What terrain can they expect? What access will they have to the technology? And above all, how much power does the General have over the simulation? In additional to all of these questions, which Dusk was in the process of ascertaining based on various evidences throughout the room, a more interesting revelation came from one of the members.An unfortunate admission from one of the participants that left a sour taste in his digitally reproduced mouth.Three of the participants were "family".They were connected to each other.What sort of competition was this that stacked the odds so firmly against him?No matter which one of the three won, they all won.Of course they would team together.He hid the bitterness behind his studious gaze. The only allaying factor to the bitterness was the obvious lack of Force connection in the simulation.It left several of the members feeling like a fish out of water.Whereas Dusk, who had no Force connection in the real world, had no sense of what was missing.Rather, as a man born of the digital world and with a layer of custom tech between him and the simulation, the tables were reversed.In a simulated world, there would exist latent functions and toolsets that could be exploited.That was the Force of a simulated world. But he would play by the rules, for now.Not least of all because the cost of cheating would rid the entire point of his participation: the reward.But Dusk was nothing if not cautious.He certainly would not encourage his counterpart, Dawn, to allow any invasive cerebral simulation without some sort of defense.Already, the CyberNerv system controller was cloning network logs and commands in real-time. Dusk half-suspected that the organization running the simulation was, in fact, counting on this. After all, the opponent of the simulation was a man who had hacked and re-written aspects of the simulation at-will.It was obvious that simply throwing regular participants, with limited access, at the General in a simulation that was life-or-death was a suicide mission for anyone involved.What better way to counter a man who has broken the system than a man born and bred from cyberterrorists and subsequently sharpened by metropolitan cybersecurity enforcement? And what of the family?This variable burned in Dusk's mind.More than the details of the planet.More than minor aspects of the simulation.Why was a chunk of the participants connected?It made little sense for a competition.But there were too many possibilities and not enough information.It was a puzzle that Dusk would have to simply attempt to ignore for now. A key question was presented: Would Dusk go alone or stick with the group?Obviously, it made little sense to go alone with no information.It was pointed out clearly that they would need to acquire weapons, let alone supplies.It was in nobody's best interest to go alone at this stage.But the endgame might prove to be a different story. "There is still too much information that we do not know." Dusk said, sternly. "We do not have any information on the target or the extent of his grip on this simulation.Best case scenario, he has no access to network events describing the arrival of new participants.Worst case scenario, he knows precisely where we have spawned. Probability is high that every non-player character will pose as eyes and ears for our target.If you allow me to tag along, I will find a way to circumvent this threat.But you will need to keep me protected." Nothing seemed more emblematic of the complexities of choreography than a media production set in a remote space station between multiple entities owned by various different private interests. There was the production crew for the Dance or Die event, of course, but there was also the daily workings of the station crew. This included not only security staff, in charge of keeping the crowds outside of unwanted areas, but of environmental crews, maintenance crews, docking staff, room keepers, and a plethora of other divisions that each had thin lines of communication outside of need-to-know orders to allow them to function in their jobs. It was a such a delicate balance of choreography that a single tip, such as an invasion of a predatory species left staff utterly confused about how to carry on. Of course, certain divisions had received word before others, such as security staff that sought to lock down the station in a discreet and unpublicized manner. But docking staff had simply been left in the dark. So when a swelling of the panicked and confused public rushed their way into the hangers to get access to their respective shuttles, the control room was sent sprawling about to attempt to bring order into chaos. In this confusion, a single transport shuttle had overridden quarantine protocols and proceeded into the hanger with little regard to staff and the confused, wealthy nobility that had hurriedly ran away from the shuttles intended landing spot in the middle of the hanger. After settling with a hiss, the shuttle’s hatch opened and revealed its single occupant - a palish woman with freckles and a the worst case of bed-head. She stretched and yawned, rubbing her eyes. Huddled before Dawn was a mass of surly and confused guests who were shouting over each other and throwing daggered glances in her direction while she simply placed her hands behind her head and swayed into the crowd. With a weary and glossy gaze, Dawn meandered with purpose, sifting and shoving her way through the Never-In-My-Lifers and I-Want-To-Speak-To-The-Managers that littered the hanger floor. A particularly familiar numbness crept along the back of her neck and skull, leaving her feeling somewhat absent minded. But she simply went along for the ride as she instinctively knew the exact direction to head. At the station entrance tunnel, several armed guards stood, halting a group of wealthy protesters who demanded to know, precisely, the meaning of all of this. The security staff remained stalwart and stone-faced, even as a lavishly dressed and well-painted neimodian woman stood haughtily with puffed cheeks. “You said you’re with the CIS?” The security guard asked Dawn. “Yeah?” She replied, staring down the very tall and portly neimodian. The trip from Delta IV to the station gave Dawn some needed rest and Dusk extra time to prepare. As the weary female laid in haphazard angles amid piles of torn food wrappers, her more studious alter-ego - unencumbered by Dawn's unconscious state - performed numerous checks on the Holonet while interfaced directly with the transport cruiser's communications relay.It was the calm before the storm, he surmised, as he rapidly caught up on the last two seasons of Dance or Die. The mission was fairly direct in the abstract: a simple capture and interrogate operation.Not for the Confederacy of Independent Systems, but rather for a no-name local former pirate-turned-club owner on Delta IV who just happened to manage a smuggling ring of some legally sketchy spice that Dawn required for...medical purposes.Dusk's counterpart, the party-hearty Dawn, had somehow managed to charm the man into incorporating the spice trade into his business on the side, in exchange for her willing advertisement and service for a line of some new clubs.It impressed Dusk what a snarky attitude and digital skin tattoos could gain a person in the Underground. The catch, of course, was that for the past six months, the pirate club owner had lost contact with one of his best supply logisticians in the sector - a man named Kan Kaan.He had taken on a job at a media company providing supply chain support and logistics for wealthy celebrities - a very lateral move in terms of job requirement but certainly more legally sound. While Dusk streamed past episodes of Dance or Die, he methodically sorted through numerous records to find which celebrity Kaan had been assigned to.Due to the nature of non-disclosure agreements to protect the celebrity's image from being associated with potentially shady third-parties, finding direct information on the Holonet in regards to staffing was tricky.Instead, Dusk created multiple matrices of data correlating to behavior patterns known to him, referencing old account transfers from when Kaan served the club owner as well as quantities and frequencies of particular orders.From this, Dusk could feed the data to a sandboxed neural network, training it before feeding it public Holonet records on supplies ordered for the latest event. Spectrum analysis and subject acquisition probability was currently at five percent.Expected completion time: two and a half hours. Expected arrival time: six and a half minutes. Dawn was neither the first nor the last to be placed on a bed.However, she would be one of the last to interface with the Harsh Realm simulation.The implant at the back of the neck would directly interface with the existing SMPl CyberNerv controller chip.This interfacing took time as the controller chip performed a number of security operations to keep the implant from accessing the subdermal system and causing hiccups in Dawn's otherwise regular biological processes. 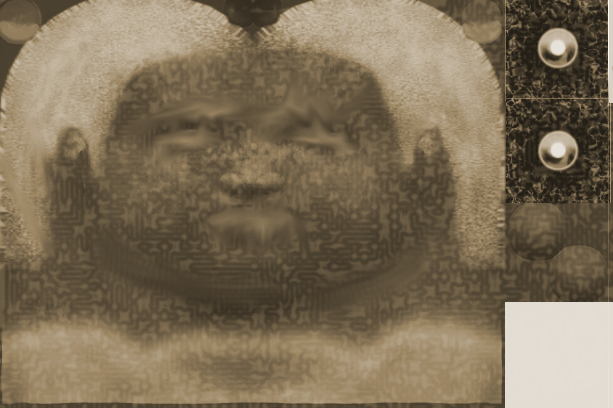 The sedative hit fast and caused a warm, tingling feeling across Dawn's body.While her consciousness slipped out during the interfacing, keen observers watching over Dawn would have caught a brief glimpse of a neon smiley projecting from her left cheek for a few brief seconds.It gave a mischievous wink, disappearing right before the interfacing had completed. An empty space where the last few remaining bits of sunlight faded through the grimy windows became the spawning point of a figure that resembled, but did not fully replicate, the appearance of Dawn.Facial features were similar, but with exaggerations on jawline strength and the broadness of shoulders.Gone were many gender-specific physical attributes, favoring an androgynous physiology.And juxtaposed to the quirky grin and impatient stature was a figure of poise and calculated patience.Where the sunlight had faded, Dusk had stood in its place, and he surveyed the surroundings with a meticulous gaze. "Now this," he spoke as his hands traced the textures of the walls and ground, "Is a VERY impressive simulation." In direct contrast to Jairdain's visible discomfort with implants, Dawn had a hard time hiding a smirk. Of course, the implant was not something she was unaware of. Virtual Holonets would require some sort of direct interface, she surmised, and her counterpart had discussed compatibility with their CyberNerv system some time before their arrival. Though the intravenous feeding tube was new information, it, too, was hardly discomforting. Rather, Dawn saw it as a distinct advantage, as her swift metabolism was the biggest drawback to utilizing her full potential. Keep those juices flowing, she chuckled in her mind. What did give her some pause was the non-specific answer to her question. She had once recalled a similar sort of answer at a cantina when she had asked who had prepared, as she described, one of the most amazing soups in the outer rim. The answer was, to her great dissatisfaction, "the cook". In much the same way as how she left the cantina more satisfied with the soup than the answer, so, too, was her satisfaction met with the offered bounty. Perhaps she'd take the million credits and buy a trip to the Outer Rim for another round of soup. "I'm with Mr. Scarface over there." She said with a lingering smirk and a gesture in Padran's direction. "Let's get hooked up and nab us a General." Wearing: Usual outfit. See profile. A charming man with a knack for poetics once extolled the virtues of a place he called home. He had often called upon Dawn to make a visit, for one reason or another. And the naive girl indulged each time, albeit with a begrudging attitude. She meandered into the slums of a Lithios metropolis, suffered the invasive security checkpoints at the edges of the district, and trudged through the scrap and garbage that were tossed outside of the door of each residence. The building reeked of a pungent odor that stung the nose like vinegar and forced an involuntary gag reflex. From the upper floors, peering through the streaky residues upon the cracked glass window panes, Dawn could see the rest of the district...where every shadow on every corner walked. Beyond all of this stood the charming man's oasis, a museum of true art collected from garbage piles of the rich upper class or nabbed for cheap on the black market. A rooftop penthouse, he extolled, constructed of bargain materials with his own two hands. Every amateurish bit of construction, every flaw of the lopsided abode gave the slipshod penthouse a defining character. And though the charmer spent every moment of her company poisoning her with his unsatisfactory essence, she found herself returning over and over again. Not for his abusive opportunism nor for his self-deluded musings, but for the art. The character. She left her home in the working class districts each night and ventured into the slums to submit herself because it was the only place she truly felt home. This city on Delta IV reminded Dawn of home. Lithios, less specifically. Or the various metropolises on its surface. Though Delta IV more closely resembled Ethos City without all of the rain. It was intriguing to Dawn how other races on other planets could form their civilizations separately, without any communication, and still develop the same sense of aesthetics. Dawn fit in on the world as if she was a native. She acquired transportation, navigated the city's labyrinth, and fit in with the local rebels, anarchists, and artists in ways that made her feel almost as if the place she once called home wasn't an invisible speck hiding beyond the neon sky. But Nostalgia was not what brought Dawn to Delta IV. It was was necessity. Well, necessity with a hint of vanity. The most effective creams and oils that Dawn had come across in recent years were in short supply. Her more studious counterpart had tracked supply shipments directly to Delta IV. Particularly, the ingredients she required would be traded out from the Port. Due to the addictive nature of the substances derived from the ingredients, Dawn found the acquisition of a supply line extremely difficult. But her counterpart had arranged a meeting with a "supplier" who could circumvent restrictions and see that the constituent ingredients establish a more local market for Dawn and other interested parties. Though Dawn was no stranger to bucking draconian authority, it was not a particular rebellious streak that had driven her necessity for these products. Her subdermal system required creams and oils to keep itself functional. The system had a large metabolic cost and required far too many hours of sleep for her to function in any normal society. But the ingredients in the spices, however addictive, helped trigger her nervous system into cooperating more efficiently with the technology and slightly lessen her need to sleep two-thirds of a day. It also helped cure dry skin which, as pale and thin as her skin already was, turned out to be entirely worth the risk on its own. The contact offered to meet Dawn at LUX sometime around the ceremony. And while Dawn was often terrible at directions, in true Dusk fashion, she felt herself compelled instinctively. She turned where she needed to turn. She obtained rides where she needed rides, and she let her thoughts wander as she strolled along the final roads that lead to the large glass building with brilliant lights. Not that she needed her counterpart's uncanny ability to memorize maps to find that building, at least. Her eyes and ears were sufficient at that point. The reverberations from the building sent waves of sensations throughout her body that, truly, she had missed. Her heart raced and a large, cheshire grin pulled at her lips. She closed her eyes and thought of a particular color pattern, and with a slight sinking feeling in the pit of her stomach, her counterpart complied. Gradually, her skin literally began to glow in fantastic, rave-like patterns as lines of morphing neon-hued tattoos streaked across her skin and face. She rolled up the sleeves of her jacket to show more of her arms and hands. The luminous tattoos shifted, displaying colorful spirographs and fractal patterns. And along her forearm, Dawn could see a display of her sleep and energy levels color-coded with a single status bar that showed a pinkish off-white shade. With a deep breath, Dawn made her way into LUX to show the Deltans how Lithiosians party back home. The mission sounded straightforward, which was the type of mission that Dawn liked best. Log in, trace the source of the intruder on the network, and eliminate the threat. The excitement of the mission welled up within her that she had simply ignored the very apt questions of the others. Her orange and blue eyes glistened as her grin widened. Or at least, she felt as if her grin had widened. She felt her heart race in her chest. She felt the adrenaline pumping through her system and the rush of neurochemical release. And all of these feelings were a complete lie. The details of the mission were absorbed far more than Dawn had realized. In fact, when she shook her head and snapped out of her daydream, she was able to recall the questions of her fellow contestants with exceedingly precise detail. Follow-up questions burned in her mind, like an itch that needed to be scratched. But when she tried to access the questions for vocalization, she found that she couldn't put her thoughts to words. The dilemma certainly looked awkward. She parted her lips to speak, only for nothing to come out. The look of agitation became evident and her grin shifted to a solid line straight across her lips. Instead, Dawn's eyes glanced at the faces of the men and women surrounding her, memorizing them. In no particular order except in the order by which her eyes had scanned the room, the Mandalorian was first. While Dawn had little experience with few cultures outside of her home world, she had encountered men of Padran Rodarch's stature in the past. Mostly in hubs and trade cities on her world, where some had passed through. Though Dawn wouldn't be able to recognize a Mandalorian at face value ( and, indeed, she simply referred to Padran in her mind as "that guy who has probably seen a fight or two"), she was familiar enough with the textbook history of the culture to make the association were it ever pointed out to her. The next person that Dawn surveyed was the blind woman, Jairdain. If Dawn was inclined to the Force, she would have more detailed thoughts about the presence of this capable woman. Instead, Dawn saw nothing noteworthy about the woman aside from her impressive violet eyes, a color Dawn was especially appreciative of. And yet despite the lack of noteworthy features, Dawn felt a single word crawl in her mind over and over again as she studied the woman: Fidelity. Caedyn Arenais was next.The man who followed Dawn into the room, like the woman whom Dawn had observed prior, had little traits that Dawn found noteworthy. Fewer, for that matter, with the only notable fact being that he was even later than she was. The last contestant that Dawn's studious gaze fell upon was the youthful red-haired woman, Shoden Moz. She was young, smallish in stature, but had an aura and general demeanor that resonated well with Dawn. Her questions were also extremely pertinent to Dawn's interests. Closer inspection had noted that one hand was missing, a fact that seemed to trigger a tingling numbness along her neck and scalp and the return of a singular thought: Fidelity. As for the person conducting the experiment itself, Dawn had little to think of her.Another woman in a lab-coat holding a datapad.But as she was the face of the experiment, or challenge, or whatever it was that Dawn had signed up for, Dawn felt it was at least worth her while to understand the full context.While the old questions burned at the back of her mind, she decided to ignore them and move on to a few new questions of her own. "Everything sounds peachy to me", she added, feeling complete control of her lips and tongue again. "Just a few quick questions: who are we doing this for, how much will we get paid, and do we get meal breaks?" The impact of bantha-hide and durasteel boots reverberated hollowly through the immaculate halls of the facility.The wearer, a young woman with a smug grin and hands shoved into the pockets of her amethystine coat, strolled casually and carelessly while she enjoyed the rapping and rhythm of her boots upon the smooth, hard floors. Accompanying the rhythmic promenade came the sharp chomps of pearly teeth upon a chewy substance and the gooey squish that followed as the chemical bonds broke down under force and saliva, only to be fully ingested moments later.The smug grin upon the young woman's face betrayed her moderated dissatisfaction at the substance's adequate, but substandard flavor that served practically on long space-travels but did little to excite.Unfortunately, while a single bar of the chewy substance was designed to provide enough nutrients for a five-hour spaceflight, Dawn was in the process of consuming her twelfth. And that particular matter was catalyst for her to answering the call.Or, rather than a call specifically, an attractive advertisement.Food costs credits, after all, and a simple competition on the holonet seemed an easy-enough method to acquire said credits.It was a risky endeavor, noted her more wise and studious counter-part, but then it was the riskier investments that often yielded the highest results.After all, it was a competition set in a well-monitored laboratory in the middle of space? Dawn's melodic stride took her past the transparent doors where she casually gazed upon the subjects inside.The sight was nothing new to her.Nor was the pungent sterility that tickled her nose with each breath.For several years, frequent visits to facilities such as this were a norm until a number of unexpected complications from her subdermal implants had finally resolved.The memories were traumatic for the duration of her childhood.But as a callous forms, so too did her trauma become a faint memory of a more painful time.Instead of stroking the pains of a time past, the display of lab equipment and sterile scents left Dawn with a prominent numbness befitting a callous. The next stop on Dawn's journey lead her to a room where lab-coated workers awaited.Dawn gazed at their faces and chewed a few remaining bites of her energy bar that had escaped the previous swallow.With her hands still dug deeply into her pockets, her grin widened. "Am I late?I'm late, aren't I?" Casually stepping past the workers, Dawn found a room with lockers.In a contrast to the sterility of the rest of the facility, Dawn could smell some faint, recent odors.Warm.Musty. Following instruction from the workers, she made her way over to the locker and opened it, grabbing the gown from inside.Without a care, and in a manner well-practiced, she disrobed and put her clothing and equipment into the locker.While disrobed, the lights seemed to refract slightly upon her skin, giving a multi-hued off-color in highlighted areas, especially the areas were the skin was thinly stretched over her subdermal implants such as her elbows, knees, and shoulders. For a few awkward moments, Dawn's multihued eyes observed the lock on the locker.She felt a sort of tingling numbness as her eyes seemed to stare blankly.She drew in a deep breath as a dizzying cloudiness washed over.The breath felt slow...labored.Deep.Her hand gripped the locker door hard, causing the metal in it to rattle a low, slow, reverberant rattle.And the pressure gripped her head. The final edge of her breath sped up.It was sharp and quick.As swiftly as the cloudiness had gripped her head, it released.Slightly disoriented, Dawn put on her gown and closed the locker.The absent gaze in her eyes shifted back to a grin as she approached the workers. "What are you staring at? "She grinned and motioned for them to lead the way to the room where everyone was waiting. Intent: To serve as a basic survival feature and plot device for Dawn Moor and to open up a useful, albeit limited, survival technology for humans without force powers. Cellular Repair:Damage to skin cells or growths due to abnormal DNA can be detected and repaired over time. Run Longer; Sleep Harder (RL;SH): Can facilitate muscle tissue recovery and accelerate cardiovascular efficiency (increase endurance) at a caloric cost. Ageless; Age Less: While few can stop the ticking of mortality's clock, the cellular repair functionality can slow the natural aging process. Metabolic: Subdermal system is powered metabolically, which is taxing.In order for the body to sustain itself with minimal usage of the SMPl system, it requires consumption of at least double a normal day's calorie count.Extensive usage of the system, such as severe repairs or RL;SH requires exponentially more calories, limiting the power of the SMPl system to a person's capacity to eat. Catching Zzzs: Due to the risks and energy constraints of operating the SMPl CyberNerv system while a person is actively awake, the Cellular Repair function can only be activated when the system detects that the user is unconscious.Early models that did not have this restriction induced narcolepsy, nausea, dizziness, and delirium in 100% of all product testers. RL;SH function is an exception, but can only be used in short durations and requires significant caloric consumption before and after use. Force-resistant: Researchers speculate various reasons for why Force-sensitive individuals cannot integrate with the system.All activation attempts have resulted in an immediate failure of the system and inevitable death of the participant. "Tell me the name, again?" "And what is a Subdubital-"
"Whatever-istis. How did you even come up with that name?" "Think of a layer of skin that's actually a weave of memory plastic and plastisheet. It goes under the skin and can be written to.Programmed." "So why not just call it programmable memory plastic?" "Because it's powered metabolically. So, meta-plastis." "Tell me the real reason." "...a girl in a cantina asked me what I do for a living. I wanted it to sound impressive." "Good man. Slap a catchy buzzword to it. Something that starts with the word 'Cyber'." The Neuro-Saav Corporation's BioTech industries has always specialized in prosthetics and cyborg technology.However, it was especially interested in meeting a market demand for cybernetic enhancement technology.The driver of this market, for a time, was a particular group of wealthy elites who saw prosthetics as inelegant and antiquated.Subdermal systems allowed an individual to retain their natural beauty while still enjoying the perks of cybernetic enhancement. Unfortunately, the first two SMPl CyberNerv models had a very temporary bubble.The first model did not make it out of testing and was only sold to wealthy individuals who agreed to the risks.Without the sleep monitoring feature, users of the first model found themselves prone to narcolepsy and fits of delirium.An upgraded model was issued immediately after.This model implemented a mandatory sleep requirement and a visual interface displayed on a person's arm to indicate glucose and exhaustion levels.Despite the displays, wealthy elites were extremely dissatisfied at the caloric and sleep requirements and requested immediate deactivation of the system. Subsequently, the third model, which boasted a programmable interface, saw little demand and production declined.SMPl CBNV3's main market was workers in particularly hazardous environments, such as mines, asteroids, and planets with thin atmospheres, who were particularly susceptible to radiation and toxins.A particular feature of SMPl CBNV3, its RL;SH mode, was lauded by construction workers and miners looking to reduce repetitive stress pain and increase productivity. Unfortunately for BioTech's profits, even SMPl CBNV3 would not last.The surgery required special training, lots of man-hours, and high expenses.The result, for employers, was a work force that could produce more in the moment, but required more feeding and more rest time in the long run.SMPl CBNV3 was eventually phased out for more favorable, natural supplements. The technology would not resurface for several decades, where it reemerged in the underground of various sectors.SMPl CBNV3 became a purely cosmetic technology, with its programmable subdermal lighting system offering unlimited combinations of brightness and color.New controller mods allowed brighter, flashier patterns and the caloric requirement served as a bonus feature for many people looking for an extraordinarily slim physique. The SMPl CBNV3 is a subdermal sheet consisting of a blended weave of Memory Plastic and Plastisheet.The Plastisheet layers bind to the Memory Plastic, thereby allowing the Memory Plastic material to subsist for a longer period of time.The Memory Plastic layers, meanwhile, are recognized by the body and remain, with the exception of force-sensitive individuals, allergy-free after the infusion process is complete. Originally, introduction of the SMPl CBNV systems required precise surgical insertion followed by two standard months of recovery time.Since medical technology has advanced, a new procedure for system infusion reduced the recovery time to a maximum of two weeks.Infusion of the system into the body first involves a preparation where a subdermal primer is spread evenly across the body.The primer is absorbed into the epidermal layers sinks into the lower layers.Once the primer has established a proper subdermal layer across the entire body, a single injection directly into the primer layer allows the Meta-Plastis system to fill the body.The next three-to-five days will see the user's antibodies break down the primer.This causes a period of mild swelling and itching.Ice baths are a common post-operative recommendation. Once the swelling has subsided, a second treatment of the Meta-Plastis material is added.As this is a thicker layer, another three-to-five days is given to allow the layer to form more permanently.During the first 10 days of the procedure, physical movement is highly discouraged as "bubbles" in the subdermal system can form. After the system has settled, the controller chip can be inserted.The controller chip is a standard firmware chip that is seated at the base of the neck and top of the spine.The controller chip is truly the heart - or brain, more aptly - of the subdermal system.The Meta-Plastis layers are a secondary nervous system and serve two functions: as input, for data analysis, and for endomaterial transportation, whether it be flushing toxins from the system or a delivery of freshly reproduced blood-cells into the body. Housed within the controller chip, as of models SMPl CBNV2 and onward, is a small, biological organ that is produced using sample DNA from the wearer.The organ is responsible for producing the cells and antibodies that are delivered through the subdermal system.The controller chip is also the center of control for the subdermal system.It handles internal data provided from the body to the subdermal system and external feedback provided to it through user control. Organ growth typically requires two-to-three days.The final days are simple calibrations and, eventually, user interface setup.As must of the control of the system is handled from visual cues imprinted directly on the skin, the layers of customization are seemingly limitless. Although SMPl CBNV3's current market is rare, given its history, most modern use cases are found in the underground raves, where the system's creative lightning offers a certain attractive appeal.Some local governments on planets with decreasing atmosphere have acquired some units of SMPl CBNV3, in hopes to mitigate an increase in radiation poisoning and death. Given the flexible nature of the control unit, some people have attempted to pair the control unit with artificial intelligence.However, the result has been tenuous at best.The consequences of deferring decision-making to an artificial intelligence is a subdermal system that operates on its own accord, which is often not in the best interest of its wearer.As such, it is recommended to only use statically programmed control units. SKIN: Light colored, but marked very notably from U.V. ray damage. Sun blemishes very noticeable in exposed parts of her body, most notably in the face and hands. Subdermal implants throughout her body are not obvious from a distance. However, close inspection will show the skin stretched across a layer of near-skin-colored sheets and nodes. Additionally, Dusk can use the cybernetic augments stretched across the subdermal sheets to project various images to Dawn through the skin, for informative or decorative purposes. FORCE SENSITIVE: No force sensitivity. Dawn is a human female who was fitted with the Subdermal Meta-Plastis Cyber Nerve Version 3 system and additional cybernetic components placed throughout various vital organs.The system is fitted with a central processor, otherwise known as a controller, that is designed to manage the numerous components in a manner akin to her brain’s subconscious control of other organs: silently but effectively. Dusk is a result of a rare phenomenon where the brain and nervous system do not easily accept the cybernetic inputs. This causes a momentary delay in signaling between the system and the brain. To compensate, Dawn’s subconscious mind has gradually translated the “echo” into a second personality that has grown over the years. Dusk is not an A.I., but rather, Dawn’s subconscious brain’s attempt at compensating for the cybernetic electrical signals. Dawn's multitude of years doing line runs in the rugged and harsh conditions of the Wasteland has trained her to be fast, nimble, and adaptive to her surroundings. While possessing no superhuman features belonging to a force user, Dawn's free-running skills are notably above average. When Dawn utilizes her implants to augment her physical capabilities, such as an increase in endurance or fast-twitch response time, Dusk’s processing abilities and overall consciousness diminish exponentially. Pushed to the extreme, Dusk will remain unconscious for extended periods of time, resulting in the eventual reboot of the processing unit. Rebooting forces Dawn to be unconscious for several hours while the subdermal system and controller performs repairs and sanity checks. To sustain the subdermal implants, Dawn requires twice that of a normal human’s daily calories. Increased usage of implants requires considerably more calories. Failure to consume enough food results in various stages of exhaustion, starvation, and collapse of immune system functionality. Dawn's implants are medical-grade and designed to repair muscular tissue, skin tissue, and cellular damage. Burns, radiation, muscular atrophy, disease, and cancers are caught and repaired by the internal repair systems. Additional functions include real-time heartbeat monitoring with electronic stimulation for fibrillation correction and blood toxicity monitoring and correction, and enhanced body temperature control. Dawn's repair functions, when activated, require her to be unconscious. The toll on her body, in combination with her hypermetabolism, means she can only be awake 1/3rd of a normal day. Lack of sleep results in the destabilization of implants which includes symptoms such as confusion, dizziness, nausea, and increasing paralysis. Dawn is a humanoid female standing at 5’6” with a pale, sun-blemished complexion. Her frame, including bone and muscular tone, is abnormally thin due to her hypermetabolism. 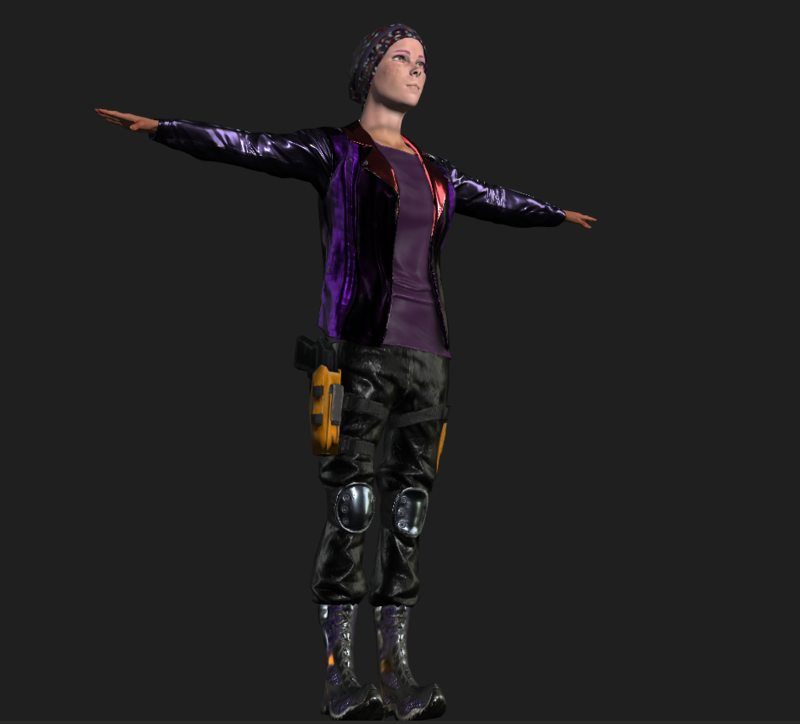 She is most often seen wearing her distinct outfit, a reflective purple and orange coat, purple shirt, black pants, sturdy yet flexible boots, and a synthetically knitted beanie. Notable attributes are her eyes: with an orange color that is stained with luminous blue spots; and various glow patterns and designs that emit through her skin like bright tattoos when she wants to be flashy. Dusk is a separate mind from Dawn.This allows Dusk to process information in parallel to Dawn, allowing the two minds to handle information separately.Dusk's thoughts are very methodical, organized, and algorithmic.He has an uncanny ability to process numbers and analyze patterns. All material things are finite, and Dusk's/Dawn's shared brain is no exception.When Dusk is highly focused on a task, Dawn's ability to focus and concentrate is diminished.She becomes forgetful, clumsy, and in extreme circumstances, vegetative. The design of the controller chip allows connectivity to various interfaces for updates, performance tweaks, and, if necessary, hard resets. Dusk has exploited a vulnerability in the interface code to bypass regulation restrictions and connect with a wider range of systems.The new code opens a sandboxed console interface with inputs and outputs that are parsed through the subdermal nervous system.With data transfer firing at the speed of nerves, this allows data input and parsing at speeds much faster than visual, audial, and tactile methods. Opening up the controller firmware to a wider range of networks involves opening up the system to a wider vector of attacks. Exposure is a massive risk to the physical survival of both Dusk and Dawn, who rely on the subdermal system and the extended cybernetic components for survival.Additional to the risks involved, the speed advantage of Data Sync is marginal compared to the raw processing power of a droid or the plethora of other artificial intelligence chips on the market. Dusk can utilize the RL;SH module in the SMPl CyberNerv system to trigger a controlled fight or flight response.This allows Dusk to process information rapidly. Typically, the RL;SH feature is used to augment Dawn's Parkour! ability.However, when Dusk utilizes this feature, he is deliberately drawing energy away from Dawn's biological functions.This puts stress on their shared physical body as energy is borrowed from organs to facilitate the fight or flight response.Prolonged usage results in decrease functionality of kidneys, stomach, liver, and other organs. Dusk retains the same outer appearance as Dawn, given that they are the same body.However, Dusk's identity is male in nature.As such, when he sees himself in the mirror, Dusk consciously blocks the feminine features and focuses more on the more androgynous features. While Dawn retains control of the physical body, Dusk controls all online interactions.As such, all online personas and records are registered as male. Where Dawn was born has yet to be discovered.But her earliest memories werethe wastelands outside of a booming metropolis.At an early age, she was scooped up by a roving cyber-terrorism clan notorious for exploiting child labor. Dawn's childhood started with manual labor throughout the camps, serving the older children who returned from line runs and the teenagers who, having survived the harsh and radioactive conditions of the line runs, spent their last few remaining years performing network attacks on various metropolis systems. Line runs began for children at the age of 10.They comprised a 3-to-5 part relay, stretching from the base camp to the outskirts of the city, where children would race across the wasteland, avoiding harsh conditions, creatures, and metropolis attack drones, to bring signal repeaters close to the city walls.These repeaters would communicate with a party within the walls, who would proxy connections to various important systems such as bank records, databases, and black market forums.However, nodes would only last several days before they are discovered and so they must be relocated. All able-bodied children perform line runs for several years until they succumb to the wasteland or demonstrate an aptitude for logic and coding.The children that do not die spend the years slaving over various cybersecurity protocols, cryptographic patterns, and network cracking tools.Dawn spent two more years following the cyber-terrorist band until a shortage of line runners forced her back out into the wasteland once more. Years of exposure weakened Dawn considerably, and as the sickness had degenerated her body over the next two years, her final line run left her slow and vulnerable.Despite her best efforts, Dawn could not escape the droid assault that incapacitated her on the spot. Rather than be left for dead, Dawn was taken in by the Metropolis vanguard.Her cancerous tissue was removed and a layer of subdermal cybernetic implants was injected beneath her bottom layer of skin.After the two-week restoration, Dawn was returned to the same spot with no recollection of her restoration.Dazed and confused, she returned back to base camp.Meanwhile, the city drones tracked her every step. Unwilling to let an expensive and useful experiment go to waste, Dawn was eventually recovered outside of the city once again.As a reward for helping the city track down the cyberterrorists, Dawn was given temporary citizenship and housing under the condition that she see a psychologist daily and attend social integration courses.It was the psychologist that helped Dawn discover the second voice in her head and it was the social integration courses that helped give rise to Dusk's personality. Much of Dawn's learned habits of survival in the wastelands rebelled against the more structured style of civilized living.But Dusk found utility within the structured living of the city.While Dawn yearned for chaos and spontaneity of an unrestricted life, Dusk found solace in the guarantee of food and shelter.At first, Dusk served as a coping mechanism - a voice to quiet the despair of living a caged life.But in the coming months and years after Dawn's integration into the city, Dusk had become a personality on his own, advising Dawn against careless actions and utilizing their shared cyber-intrusion background to provide a reasonable living.